A Sector is no mere sport watch. A Sector is an aggressive sport watch that offers top performance, stylish design and knows No Limits. Heavily influenced by design, function, durability and wear-ability suggestions from Sector's No Limits team of super-athletes (who also test them in the field), Sector watches are a product of continuous innovation, research and development. Each model is a high performance timepiece of guaranteed quality and reliability, even in the most extreme conditions. 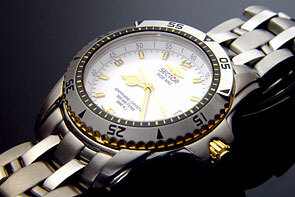 All Sector watches are modern and sharp in design and feature Swiss Quartz or Automatic movement. All are also water resistant to a minimum 300 feet, built with strong and durable materials (steel and titanium) and are available in men and women's design. The Sector Expander collection features a broad selection of models including: the trendy, no-nonsense 130 series designed to appeal to the younger generation; the Expander 135 series which are distinctively smooth in style and innovative in design; the highly individual and energetic Expander 750 series; and the Expander 950, a study in sharp design, strength and durability - a perfect combination of Swiss technological innovation and style for unlimited performance.